For Summer 2019, Rooks to Cooks Summer Cooking Day Camps will be running at the following 12 GTA locations: Bathurst & Lawrence, Beaches, East York-Danforth, Etobicoke, High Park, Markham, Midtown, Mississauga, North York, Scarborough, The Annex, and Thornhill. There are 10 deliciously-themed sessions to choose from, ideal for aspiring chefs ages 6+. All lessons are hands-on, intensive and fun! Daily activities are primarily cooking; however, children take 2 daily outdoor breaks where they can participate in camp-style games and crafts with Camp Counsellors. Small class sizes guarantee a thorough and intensive education. Maximum 20 children per session and 4 staff for a 1:5 staff-to-camper ratio. 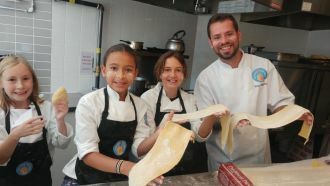 Cooking camps offer children the chance to learn culinary skills from experienced chef instructors. Camp sessions begin with full cooking demonstrations by the chefs, followed by recipe execution by the campers. Children work in pairs to complete 4 to 5 recipes daily. Campers will also take samples of their dishes home to share with family! Kids will enjoy making and tasting their yummy creations at these unique summer cooking camps. Themes and recipes for 2019 include: Around the World, Budding Bakers, Perfecting Pastries, Sweet & Savoury, and Master Chef. Recipes change every year, so campers will always learn new cooking skills and dishes. This camp experience is sure to create amazing memories that will remain with campers for years to come!